Are you still surprised that the psychics industry has a lot of frauds? Well… there are still several scams which occur every day online and there are millions who fall a victim to this. One out of every four psychics who operate online is genuine and other three are somehow conducting a scam. This will throw light on a clearer idea of several fake psychics conducting scam and harassing innocent people in real need of help falling prey to these evil self-proclaimed psychics. Looking into the future, we desperately need to differentiate between real guiders and scams. The real psychics are really not happy about the fact and why these scams are happening online and what are these frauds getting by conducting such scams. This is hampering the trust of the people and the genuine psychics are also suffering due to this. Well, the frauds are greedy and want to make money by unfair means. Thus, they are pretending as psychics which they are actually not. To these several evil fraudsters operating online, the desperate needs of the several out there mean nothing to them. They are not at all bothered about the emotions of the several people out there who desperately need psychic help. So, here are certain tips to find out the real psychics and to avoid the scammers. 1) There are lots of the fake psychics who operate online and ask for your date of birth or your star sign demanding that they would provide an amicable solution to their problems in life. They very trickily ready the astrology updates from any newspaper and then make it sound in different wordings and scam the people. 2) The fake psychics will ask you about the country where you reside and the social status they have. Knowing that they will tell certain generic things based on the information provided by you and demand their claim for fame. To set an example if someone says that he or she stays in India and in which state and city they reside, you may make a picture of what kind of lifestyle they can be leading. By using some tricks from the book of Sociology, they will give you predictions that will seem to be real but there is no magic in this. These are the techniques which the fraudsters used to scam the general public who are in desperate need of help. 3) There are several times the fraud psychic will tell that there are certain evil spells and black magic on your near and dear ones for which they may suffer a lot in the near future. This will indeed be a worrying factor for you and you will be desperate to hear solutions from them. Thus, you will be inclined to costly solutions which they prescribe. The worst part is that those solutions are bogus and do not work at all. 4) Another major tip as advised by the experts is that there will be many fraud psychics operating online who falsely claim for fame by saying that they have worked and given solutions to several Hollywood stars but actually none have heard about their name ever. Only what they have is an online site by which they operate. If you are coming across such psychics online, this is obvious that you are dealing with a fraudster who is trying to conduct a scam with you. You should always be careful and identify such spams while in a search for a psychic. 5) The fraud psychics will never be very keen to face a lot of questions. What they will do is will first ask you a lot of questions regarding your life and then make a conclusion based on your lifestyle and other things that you have revealed about yourself. They absolutely do not have any in-depth knowledge about their clients and will only make airy-fairy future readings which is not of much use to you. These is one of the major signs that you are talking to a fake psychic online. 6) There are several psychics who operate offline and they observe the customers on their clothing and the jewelry that you have been wearing. Basis on that they can guess your lifestyle. Also the way you walk and talk is being observed by them and they can guess on your lifestyle. Depending on that, they will form perceptions of you and will tell you about you and your future. Also do not reveal about your job status, earnings etc. which will give them ideas. 7) Also do not reveal about your personal lifestyle in front of a psychic whether online or offline. The fake psychics will always try to ask you multiple questions and on the basis of that they will give you answers to your queries. Also they have some bogus tricks which they try to implement and then make readings which will actually be fake and no use to you. They will try to manipulate you from various angles and then then fool you. They will also try and ask you about your family members and form ideas about your background and then try and give you answers based on that. 8) So, be careful in picking the best psychic out of the many of the best online psychics and be careful so that you do not fall victim to a fraudster who is operating a scam online. There are instances of millions of people losing their money to such fraudsters and this has become a major scam. 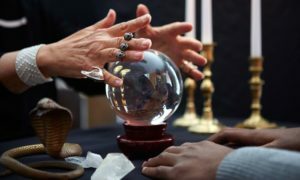 This scam is operating worldwide and there are lot of people complaining in various consumer sites about their bad experiences with the various fraud psychics and thus nit requires to pay a lot more attention while choosing a genuine psychic. 9) Patients should also take note that these types of fraudulent gangsters those who are spoiling the names of genuine psychics will ask exorbitant fees from them. So, guys those who are planning to enter these types of premises should do some research about them.